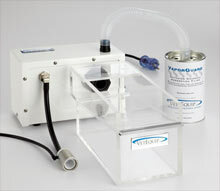 The Scavenging cube creates low-pressure/high-flow exhaust for chambers such as the VetEquip Vented Chamber, and low-flow/high-pressure vacuum for circuits like the CX-series nosecones or similar. Vent to a VaporGuard filter or in-house evacuation for easy removal of all waste gas. 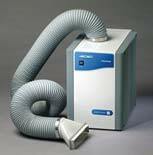 Self-contained recirculating air cleaning systems plug in to any 110 outlet to remove contaminated waste gas at its source. 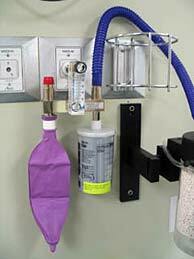 With the combination of these three products, you are able to scavenge a variety of anesthesia stations. The only scavenging interface system available with a backup, alternative method of scavenging, as well has being MRI compatible. A newly designed vacuum/scavenging interface with scavenging redundancy. Scavenging Simplified! The Matrx™ Central Scavenger... one less thing to worry about in your clinic. Keep your mind free to focus on caring for your patients, not on scavenging excess anesthetic gas. 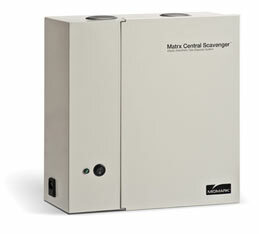 The Matrx™ Central Scavenger safely removes waste gas from your clinic without the cost or hassle of charcoal canister replacement. 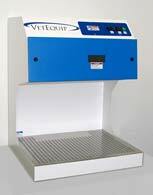 The Downdraft Anesthesia Work Station is specifically designed to provide a small bench-mounted unit with unrestricted access for those procedures that are difficult to perform in a fume cabinet. The downflow action takes the contaminated air away from the operator and an audible alarm will alert the operator when the airflow falls to an unacceptable level. A common hazard of inhalation anesthesia is the release of waste anesthetic gases into the breathing environment of the personnel. 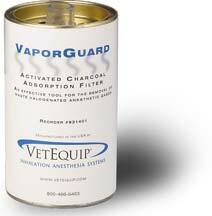 In a recent independent study, VetEquip's VaporGuard filter was shown to be the only filter that prevented waste anesthetic gas break-through when used as directed. Introducing the VaporGuard XL-R. 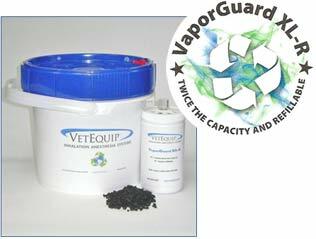 The "XL" means this canister has twice the carrying capacity than the current VaporGuard canister; which means it will hold 100g of agent vs. the current 50g. The "R" designation means a refillable/reusable canister. This is designed to be taken apart by you, the investigator and refilled with bulk carbon you can acquire from VetEquip. The unique modular design makes repair a breeze for any biomed or central supply department. The unit is made up of six (6) easy-to-replace modular components. Unlike the normal plastic inlet and outlet connections on most units, the cast metal backplate connections are extremely durable, thereby saving unnecessary repair costs. As a result of its modular design, the unit is 25-50% smaller than other suction regulators making it the product of choice for crowded wall and rail areas. The case is made of strong ABS plastic. It features a smooth surface with rounded corners making cleaning easy. The case also houses the gauge for extra protection. 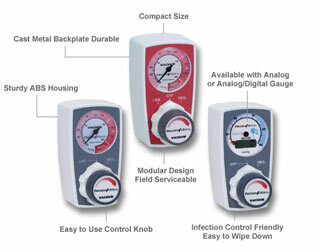 The large control knob and easy-to-read settings make vacuum adjustments simple, even in emergency situations. 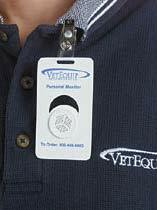 Badges are worn by personnel in the anesthesia procedure area. The badge adsorbs halogenated hydrocarbons (including isoflurane and halothane). After being worn for 8 hours, they are repackaged in foil containers and sent to a chemical laboratory for analysis. The lab determines the exposure levels and reports the results.